Flowers on SNL — San Francisco Florist | ACME Floral Co. I love Saturday Night Live. I love it when they break and can't hide their smiles. I love it when the stars know it's awful and slug on through and ride that beast of a skit all the way to the end. 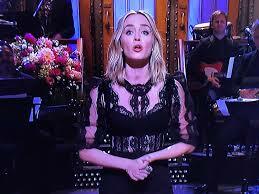 And I love the flowers in the opening monologue. I think of them as part of the band and I can often tell what season the episode was filmed in by the color and product in the arrangement. I do miss G.E. Smith though on guitar. If the monologue is rough I can always be entertained by that floral arrangement and all the glorious details sunk into that puppy.